Gotham is pulling out all the stops for its final season, including an appearance from one of Batman’s most formidable foes. After weeks of teasing, actor Shane West’s interpretation of Bane has finally been revealed to us via Entertainment Weekly. The official first look comes hours after writer and producer Tze Chun posted a low-res set photo of the character on Twitter, which can be viewed below. You can see EW’s exclusive image here. Last month, West was said to be playing Eduardo Dorrance, an old acquaintance of Ben McKenzie’s Jim Gordon. Fans quickly began speculating if this character was related to Sir Edmund Dorrance, aka King Snake, who turns out to be Bane’s father in the comics. Those suspicions were confirmed at this month’s New York Comic-Con. The producers also revealed that the show will feature a new take on the famous Knightfall splash page. Rather than Bruce Wayne, Sean Pertwee’s Alfred Pennyworth will have his back broken by the character during the upcoming season. West’s outfit more closely resembles Darth Vader than anything we’ve seen Bane wear in the comics or in other adaptations. It’s possible that the breathing apparatus seen in the photo is influenced by Tom Hardy’s portrayal of the character in Christopher Nolan’s The Dark Knight Rises. This would mean that the show is eliminating Bane’s use of the Venom serum that gives him his enhanced strength. Alternately, the writers could be re-imagining the serum as an inhalant rather than a liquid that gets pumped into the character’s brain. Regardless of what’s in store, it’s important to remember that this season is set 10 years before Bruce becomes Batman. 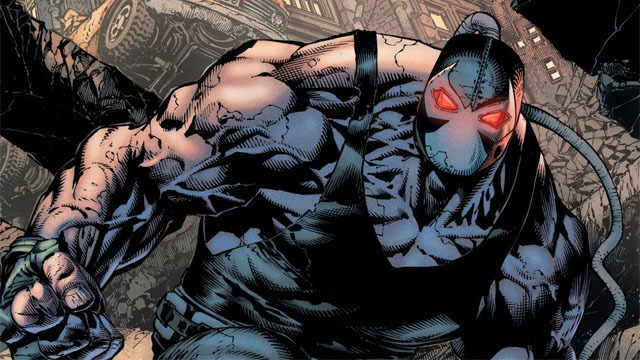 Although we may not see Venom just yet, this version of Bane may be a prototype for what’s to come. Gotham’s fifth and final season premieres in 2019. What do you make of Bane’s new look? Give us your impressions in the comment section below!